Discover some fabulous resources that will help you plan your apples preschool theme. These activities are geared for kids ages 2-6. Perfect for preschoolers! As summer comes to a close, apple season is coming! There are so many fun apple theme preschool activities to explore with your children. Surround yourself with apples of red, green, and yellow. Fill your learning space with scents of cinnamon and apples. 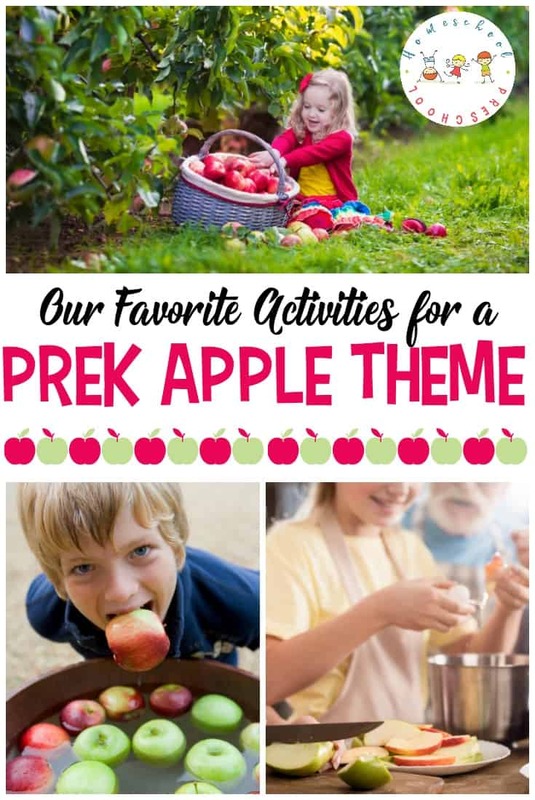 Choose an activity from each category below, and you’ll have the makings of an amazing preschool apple theme unit to use this fall! I love teaching about apples. Preschoolers love learning about things they are familiar with. An apples preschool theme is perfect for autumn and back to school. • Apple Printables for Your Apples Preschool Theme – Start the new year with a fun and engaging Apples Preschool Theme! This amazing collection of apple printables is just what you need to get started. • Apple Theme Writing Task Cards – If you’re focusing on apples in your homeschool preschool, be sure to include these apple theme task cards in your writing center. • Ten Apples Up On Top Math Pack – Bring the story to life when you add these Ten Apples Up on Top to your early learning math centers. Counting to ten has never been so fun! 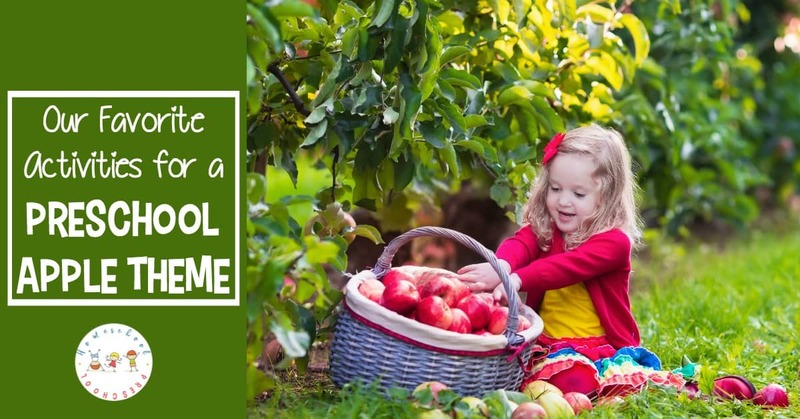 • Johnny Appleseed Preschool Pack – Whether you’re celebrating Johnny Appleseed Day or supplementing your apples preschool theme, don’t miss this free Johnny Appleseed preschool activity pack! • Printable Johnny Appleseed Activities – These printable Johnny Appleseed activities are perfect for celebrating Johnny Appleseed Day or supplementing your apples preschool theme! • Counting Fun with Johnny Appleseed for Preschoolers – Young learners will have fun practicing their counting skills with this free activity featuring Johnny Appleseed for preschool. • 20 Science Activities for Your Apples Preschool Theme – It’s time to gear up for back to school. Add one or more of these science activities to your apples preschool theme. The kids will love it! • 3 Hands-On Activities for Your Apples Preschool Theme – Apples are everywhere in autumn. They are falling off the trees and showing up at stands along the road. Discover 3 apple activities to do with your preschooler. • 5 Ways to Celebrate Johnny Appleseed Day – On September 26, celebrate Johnny Appleseed Day with these fun, hands-on activities that teach about his life and about apples. • 20 Apple Sensory Bin Ideas for Preschoolers – Wow! What a great collection of apple sensory bin ideas for preschoolers. They’re perfect for your apples preschool theme. • Hands-On Activities for Johnny Appleseed Day – Johnny Appleseed Day is celebrated on either March 11 or September 26. These hands-on activities will help you and your preschoolers join in the fun! • Apple Craft Ideas for Preschoolers – Summer is winding down, and autumn is just around the corner. It’s a perfect time to explore some new apple craft ideas with your preschoolers. • Our Favorite Collection of Preschool Apple Books – These preschool apple books are ripe for the pickin’ and your little ones are sure to love each one. Fill your autumn book basket with books from this list. • 15 Versions of the Johnny Appleseed Story – Fill your autumn book basket with one or more of these storybook versions of the Johnny Appleseed story. Perfect for Johnny Appleseed Day!